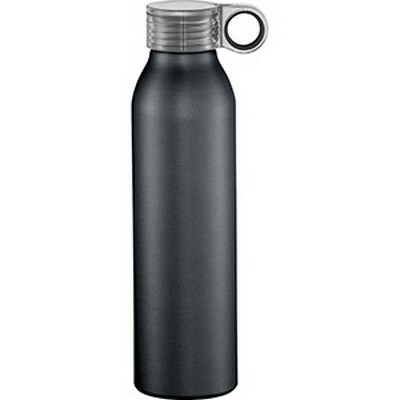 Description: BPA-free Aluminum sports bottle features single wall construction with a screw-on spill-resistant clear lid with color pop feature on the hook. Features: Easy to carry, it comes in a matte, metallic color finish. Hand wash only please follow any included care guidelines. 650ml capacity. Packaging: Polybag Colour: Black Material: Product Size: 220mm(h) x 72mm(w) Freight details : 36 per carton, 5kgs, 46 x 47 x 28cms; Decoration Type(s): Colour Print / Full Colour Print / Laser Engrave Decoration Area: Print: 45mm(h) x 45mm(w). Price includes : 1 Colour 1 Position Print. Setup is included.